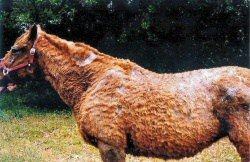 A horse with a severe, bacterial skin infection presented with a long shaggy coat, along with highly-sensitive areas of dry, dead skin and multiple areas of skin infection with pus (see two photos at left). 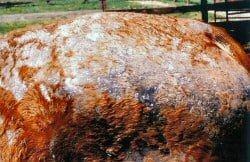 It looked like Rain Rot on steroids! The result – a successful recovery from infection and full re-growth of the coat. Banixx is highly effective in the treatment of skin infections in horses due to dermatophilosis (rain rot, rain scald, rain sores, mud fever), dermatophytosis (ringworm), and pastern dermatitis (greasy heel, scratches, mud fever, cracked heels). A twice daily application of Banixx will yield results in record time – generally 3-4 days. Re-growth of hair takes a while of course so requires a little patience. Banixx is well tolerated by your horse due to its lack of odor and it does not sting. When treating your horse’s or pet’s skin condition, it’s a good idea to discover and identify how to avoid a recurrence of that particular skin infection to assure a future healthy skin, coat, and horse. In addition to treating your horse or pet’s skin infections, it’s always a good idea to learn what to do to avoid a recurrence of that particular skin infection. To learn more about common skin conditions in horses (and how to avoid them), click here. NOTE: The symptoms of Cushing’s disease can often mirror certain skin conditions. If you suspect your horse has Cushing’s disease, contact your veterinarian. While Cushing’s disease has been recognized for more than 70 years, only recently are there improved diagnostic and treatment options. 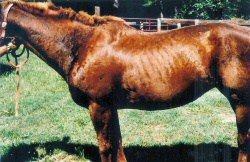 A horse with Cushing’s disease can live longer and enjoy a better quality of life. Learn more about Cushing’s disease.